Delos Postural Proprioceptive System ver. 6.5 measures the influence of proprioceptive, visual and vestibular information on the effectiveness and safety of antigravity movements, from walking to the most complex sports gestures. It evaluates proprioceptive control, visual dependence, and the risk of fall and injury. Duration: 3 minutes. The test quantifies visual-proprioceptive control creating high-frequency instability conditions. Duration: 6 to 9 minutes according to difficulty level. The test evaluates stability of the head and head-trunk coordination while stepping (2 DVCs required). Duration: 50 seconds. The test assesses stability in double stance under different sensory conditions. Duration: 2 minutes 40 seconds. The test assesses the functional stability of the pelvis-spine system. Duration: 5 minutes. 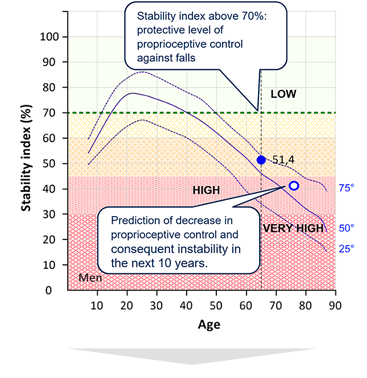 The level of proprioceptive control (stability index with eyes closed) is an early indicator of an emerging instability and future fall risk, even if not perceived at the moment. All tests provide immediate printable reports (pdf files) with automatic interpretation of the results. The static and dynamic tests highlight different levels of injury risk and performance limits. An insurgent instability, predictive of future risk of falling, can be discovered ten years before it becomes evident. STATIC TEST MONITORING. Improving proprioceptive control (blue column) above 90% gives the subject the maximum protection against injuries. The graph shows the case of a plantar fasciitis that progressively disappears when proprioceptive control overcomes 80%.